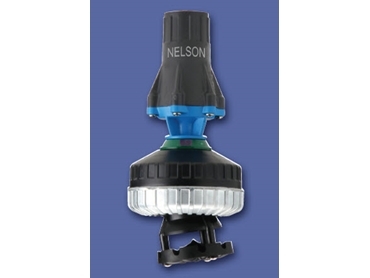 Nelson ’s innovative O3000 Orbitor pivot sprinklers have recently won an AE50 award from the American Society of Agricultural & Biological Engineers. The AE50’s are awarded to a maximum of 50 products internationally. The awards were founded to recognise the innovative engineering of products in the areas of agriculture, food and biological systems. benefit producers by saving time, labour and money. The Orbitor pivot sprinkler offers irrigators durability, reliable operation and a long wearing life, even in the least hospitable watering environments. These pivot sprinklers have been developed to take advantage of new technology that eliminates attached debris in order to provide irrigators with a uniform water application of optimal size droplets at low operating pressures. relative throw distance at mounting height of 6' to a diameter of 58' (1.8-17.7M). Visit Nelson’s website for more information on the innovative water application solution.